The general assumption in our culture is that children must be taught to read. Vast amounts of research go into trying to figure out the scientifically best way to do this. In the education stacks of any major university library you can find rows and rows of books and many journals devoted solely to the topic of how to teach reading. In education circles heated debates–dubbed “the reading wars”–have raged for decades between those who believe that most emphasis should be placed on teaching phonics and those who take what is called a “whole language” approach to reading instruction. Many controlled experiments have been conducted comparing one instruction method to another, with kindergartners and first graders as the guinea pigs. The phonics people say that their method has “won” in those experiments, and the whole language people say that the experiments were rigged. The evidence from the standard schools is that reading does not come easily to kids. Huge amounts of time and effort go into teaching reading, from preschool on through most of the elementary school years. In addition, educators encourage parents of young children to teach reading at home in order to prepare the children for reading instruction in school or to supplement that instruction. Large industries have developed around the creation and marketing of instructional materials for this purpose. There is no end to interactive computer programs, videos, and specially sequenced books designed–“scientifically,” according to their proponents–to teach phonics and provide a growing base of sight words for beginning readers. I read an article by two cognitive scientists claiming that the next development in reading instruction is going to be individualized instruction. According to the authors, modern brain imaging methods will be used to figure out the unique learning style of each child, and digital text-delivery programs will be used to teach reading to each child according to his or her unique needs and way of learning. The authors and their colleagues are, indeed, working on developing such systems. To me, this seems silly. The unique needs of each child, as they affect learning to read, are not just functions of differences in brain hardware, but vary from day to day and moment to moment based on the child’s specific experiences, wishes, and whims, which the child himself or herself controls. I’ll begin to believe these researchers’ claims when I see evidence that brain imaging can be used to predict, in advance, the contents of daydreams. In marked contrast to all this frenzy about teaching reading stands the view of people involved in the “unschooling” movement and the Sudbury “non-school” school movement, who claim that reading need not be taught at all! As long as kids grow up in a literate society, surrounded by people who read, they will learn to read. They may ask some questions along the way and get a few pointers from others who already know how to read, but they will take the initiative in all of this and orchestrate the entire process themselves. This is individualized learning, but it does not require brain imaging or cognitive scientists, and it requires little effort on the part of anyone other than the child who is learning. Each child knows exactly what his or her own learning style is, knows exactly what he or she is ready for, and will learn to read in his or her own unique way, at his or her unique schedule. Over 20 years ago two of my undergraduate students conducted a study of how students learn to read at the Sudbury Valley School, where students are free all day to do as they wish (look back at my essay on Sudbury Valley). They identified sixteen students who had learned how to read since enrolling in the school and had received no systematic reading instruction, and they interviewed the students, their parents, and school staff to try to figure out when, why, and how each of them learned to read. What they found defied every attempt at generalization. Students began their first real reading at a remarkably wide range of ages–from as young as age 4 to as old as age 14. Some students learned very quickly, going from apparently complete non-reading to fluent reading in a matter of weeks; others learned much more slowly. A few learned in a conscious manner, systematically working on phonics and asking for help along the way. Others just “picked it up.” They realized, one day, that they could read, but they had no idea how they had learned to do so. There was no systematic relationship between the age at which students had first learned to read and their involvement with reading at the time of the interview. 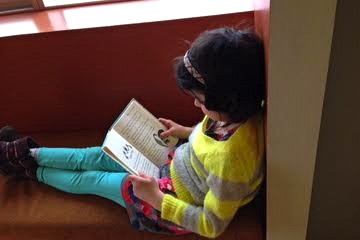 Some of the most voracious readers had learned early and others had learned late. My son, who is a staff member at Sudbury Valley, tells me that that study is now out of date. His impression is that most Sudbury Valley students today are learning to read earlier, and with even less conscious effort than before, because they are immersed in a culture in which people are communicating regularly with the written word–in computer games, email, Facebook, cell-phone texting, and the like. The written word is not essentially different to them than the spoken word, so the biological machinery that all humans have for picking up spoken language is more or less automatically employed in their learning to read and write (or type). I’d love to study this in some way, but so far haven’t figured out how to do it without being intrusive. Several years ago (see post of January 6, 2010), I invited readers of my blog who are involved in unschooling or Sudbury model schooling to write to me with stories about learning to read without formal instruction. Eighteen people–most of whom identified themselves as parents of unschoolers–kindly shared their stories with me. Each story is unique. Just as my students found in their study at Sudbury Valley, there seems to be no pattern to how unschooled children today are learning to read. By listing and organizing the main points made by each story, I did, however, extract what seem to me to be seven principles that may cast some general understanding on the process of learning to read without schooling. I have chosen to organize the remainder of this essay around these principles and to exemplify each with quotations from stories that were sent to me. Some of the people who sent stories asked that I use only their first names and not their children’s names, so I will use that convention throughout. For children in standard schools, it is very important to learn to read on schedule, by the timetable dictated by the school. If you fall behind you will be unable to keep up with the rest of the curriculum and may be labeled as a “failure,” or as someone who should repeat a grade, or as a person with some sort of mental handicap. In standard schools learning to read is the key to all of the rest of learning. First you “learn to read” and then you “read to learn.” Without knowing how to read you can’t learn much of the rest of the curriculum, because so much of it is presented through the written word. There is even evidence that failure to learn to read on schedule predicts subsequent naughtiness in standard schools. One longitudinal study, conducted in Finland, found that poor reading in preschool and kindergarten predicted poor reading later on in elementary school and also predicted subsequent “externalizing problem behavior,” which basically means acting out. But the story is entirely different for unschooled children. They may learn to read at any time, with no apparent negative consequences. The stories sent to me by readers of this blog include 21 separate cases of children learning to read in which the age of first real reading (reading and understanding of novel passages of text) was mentioned. Of these, two learned at age 4, seven learned at age 5 or 6, six learned at age 7 or 8, five learned at age 9 or 10, and one learned at age 11. Holli wrote that when her son was “about 3 1/2” she began trying to teach him reading. “I think the Bob books are stupidly repetitive and inane, but I found ones that were at least moderately engaging and had him start practicing them. … He really was not ready yet, I think, for actual reading, and whether he was or not, he resented being made to do something that wasn’t his idea, so he resisted. … Pretty quickly I realized that in spite of the progress he was making in reading skill, I was doing more harm than good to my son, because I was making him hate reading. I immediately ceased formal instruction in reading, and just went back to reading to him whenever he wanted me to.” Holli went on to note that, roughly two years later, her son “entirely surreptitiously” began to look at books on his own and eventually to read, apparently hiding his interest and practice so as not to feel pressured. Marie wrote, of her son, now age 7: “He is an artist and spends hours drawing things, especially stories and inventions. So naturally he wished to make his pictures “talk” with captions, titles, instructions, and quotations. … There was a lot of ‘MOM? How do you spell Superdog wants to go home?’ I would spell out the sentence and five minutes later, ‘MOM? How do you spell Superdog sees his house? '” This boy learned to read, at least partly, by reading the sentences that he, himself, had written. Lest you leave this essay with the belief that I and the people who have contributed these stories have taught you something useful about how to “teach” or “help” your child to read, I assure you we have not. Every child is unique. Your child must tell you how you can help, or not help. I have no idea about that, nor does any so-called reading expert. My only advice is, don’t push it; listen to your child; respond appropriately to your child’s questions, but don’t go overboard by telling your child more than he or she wants to know. If you do go overboard, your child will learn to stop asking you questions. Peter Gray is a research professor of psychology at Boston College. His most recent book is “Free to Learn: Why Unleashing the Instinct to Play Will Make Our Children Happier, More Self Reliant, and Better Prepared for Life” (Basic Books, 2013). He is also author of an introductory psychology textbook (“Psychology,” Worth Publishers, now in its sixth edition), a regular blog for Psychology Today magazine called Freedom to Learn, and many academic articles dealing with children’s natural ways of learning. A. Halonen et al., (2006). The role of learning to read in the development of problem behaviour: A cross-lagged longitudinal study.British Journal of Educational Psychology, 76, 517-534.